Emotional Pain vs Physical Pain --> How is heartbreak related to physical pain? What is the significance behind it? How are intrusive thoughts related? What are they? The symptoms of withdrawal, how can the feeling of heartbreak be related to drug withdrawal? How is heartbreak related to physical pain? What is the significance behind it? (1) Studies show that the average human brain registers the emotional pain of heartbreak (discussed in previous rounds) in the same way as physical pain. This explains why someone could feel unbearable amounts of pain after they have felt various symptoms associated with "heartbreak" such as betrayal or feeling miserable. Because of the hormones our brain releases when becoming attached to someone or something, the term love is often referred as addictive. We crave the natural positive hormones this sensation induces, such as joy or feelings of ecstatic relief. In particular, hormones such as dopamine and oxytocin make us want to repeat behaviors, and are released at elevated levels of relationships. When the event of heartbreak takes place, these hormones levels drop and are replaced with the stress hormone cortisol. (2) Cortisol works with certain parts of your brain to control your mood, motivation, and fear. Think of it as nature's built-in system! (1) However, too much cortisol over a period of time can contribute to anxiety, nausea, acne and weight gain. (3) Examples of physical effects and symptoms caused by this hormonal drop include chest pain. This is a common physical response to intense stress or emotions . Another effect can be weight fluctuation, depending on how individuals cope with eating habits in a stressful period of time. Some may eat to calm themselves down, while others find food indigestible and form digestive issues. Other examples include problems falling asleep, stomach pains and weakness. Again, all of these physical symptoms are connected to how our brain mentally copes with these unwell feelings. (4) Intrusive thoughts can be defined as unwanted thoughts or images that one finds distressing and/ or disturbing. 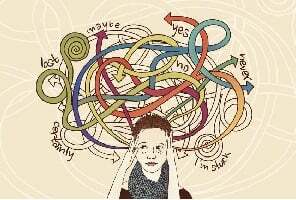 Intrusive thoughts can also result in compulsions, which are actions one takes to help cope with a thought. But, how are they related to heartbreak? (5) When our brain is going through the mental hurting of heartbreak, our brain will generate thoughts of the loved individual or object, that invade our thoughts without warning. Examples may be a mental image of the person, a memory, a snippet of conversation, or some other form of reminder. Each time we have an intrusive thoughts, it metaphorically "opens our wound", which reactivates our emotional and physical pain. It also triggers our withdrawal symptoms. Scientifically proven, intrusive thoughts can invade our mental thinking dozens of times in an hour. How it is a form of pushing us back from coping and healing, it is clear why so many people struggle to recover. How can the feeling of heartbreak be related to drug withdrawal? (5) As I mentioned previously, intrusive thoughts can open connections of withdrawal symptoms. Fmri (functional magnetic resonance imaging) studies have found that heartbreak activates the same mechanisms in the brain that get activated when addicts are withdrawing from drug substances, such as cocaine. Because of this, these powerful withdrawal symptoms from the loss of love will impact our ability to think, focus and function. (6) Just like drugs of abuse, any form of love begins with euphoria and ends with craving. In the photo above, a brain in love and brain affected by drugs are compared. And that's all for this round of research! In my next and final round, I will be researching about the science behind the healing of heartbreak. I will be going in depth of what a broken heart teaches you mentally and emotionally. I will also explain if we risk hurt to love and it's concept. Finally, I will be discussing how heartbreak motivate one to pursue happiness in the future. I loved the research this week! As our topics are pretty closely related, I found it interesting to read that you came to some of the same conclusions as I have (namely, that love can be addictive). If I had any complaint, it was a little hard to read the diagram that you attached. It looked very informative from what I could see, though. I found it really interesting that love withdrawal or heartbreak can display some of the same symptoms that drug withdrawal do--wow! Really cool research! I found it very informative and just the right length. I've always believed emotional pain was far greater and worse than physical pain, with heartbreak being the worse of all. I find it interesting that there are physical pains involved in emotional pain too, when there isn't emotional pian during physical pain, which reinforces my idea that emotional pain is more painful. Which might be an interesting thing to look into for your next round. Your next rounds sounds really interesting! I really love the idea of looking into how heartbreak teaches you lessons about your future. How it will help to fuel the desire to find love in the future. I think that it fuels you to do this, because if you have felt heartbreak, than love came before that. Having love once, makes you want to continue in that happiness, which is what fuels you to get that love again. That it my theory. I wonder if you will prove me to be right or wrong in your next round? Wow, this is an amazing topic, intriguing and relatable. I like how the information is organized and broken down. It is clear and understable information. You knew that the scientific side of heartbreak would be so interesting. Wondering what the effects of expressing heartbreak through a creative outlet like writing in a journal or writing a poem or a song from a scientific perspective? this is a really cool topic. I never knew that there was an actual science behind a heartbreak. Your research was very interesting to read, never a dull moment. I never knew that a heartbreak could contribute to physical pain. I suppose it makes sense because anxiety can effect your physical state so why not a heartbreak? I have always wondered what the science behind love was, it is very interesting that it all comes down to hormones. It was also surprising to hear that "...heartbreak activates the same mechanisms in the brain that get activated when addicts are withdrawing from drug substances..." It seems crazy that love can effect someone so much. Great topic - everyone has felt emotional pain before, but we never really stop to think how it affects our brain because we're so caught up in it. I definitely found your points about intrusive thoughts interesting. When we're upset or sad, we often think repetitively about a memory that may have caused these feelings. I never thought about that as "intrusive" but like you said, it really is. Hope that helps! This research was really cool, keep up the good work! Great round of research! Your topic is extremely intriguing, and I liked how you looked at both the emotional and the physical pain associated to heartbreak. It was interesting to read about the change in hormones, and also how heartbreak is similar to drug withdrawal in a way. Because heartbreak has similar symptoms to drug withdrawal, I'm curious to learn about the ways that people can push past and essentially "recover" from it. It would be interesting to know what methods work best and why, and perhaps a look into the brain of a person healing from heartbreak such as levels of different hormones.